How to install and activate network licenses with Artlantis version5? At an instant, Artlantis can be launched on x number of client workstations simultaneously (where "x" is the number of workstations with licenses). Once it is launched on x number of workstations, Artlantis will not launch on any additional workstations without first closing it on one of the workstations where it is open. A physical network with Mac and/or PC workstations connected. Virtualized network connection is not supported. A specific "Network" serial number. Install and validate the license either via the Internet (recommended) or manually. The server can be any computer connected to the network. It is recommended to select a computer that is connected to the Internet. Please note that a machine cannot be host and workstation at the same time. On a LAN, select the computer that will act as the server*, then launch Artlantis License Manager, available in the Artlantis installed folder. Choose the KeyServer for Artlantis tab. Locate the serial number* (composed of two numbers separated by a dash) that is shown on your registration card or which was e-mailed to you. Click on the OK button. A message will be displayed confirming activation. 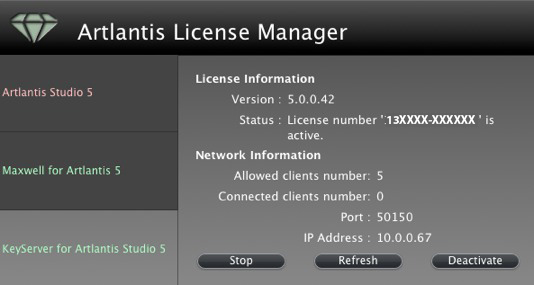 The license and network information are displayed in the Artlantis License Manager. Click on Start to launch the KeyServer. In case of no Internet connection. Locate the serial number (composed of two numbers separated by a dash) that is shown on your registration card or which was e-mailed to you. Launch Artlantis License Manager available in the Artlantis installed folder. Note down the identification number located on the license handler (this number is encrypted). Once the activation page appears, enter the identification number that you had written down earlier and then click on the button "Connect to server". You will be issued with a license number that you will need to copy and paste in the Enter your Activation code field of the license handler. NB: Artlantis License Manager must only be launched on the server workstation. * In order for the client workstations to be able to use Artlantis, the KeyServer license must be activated and Artlantis License Manager must be launched. Make sure that you use the same subversion of Artlantis installer that you used to install Artlantis to your server. 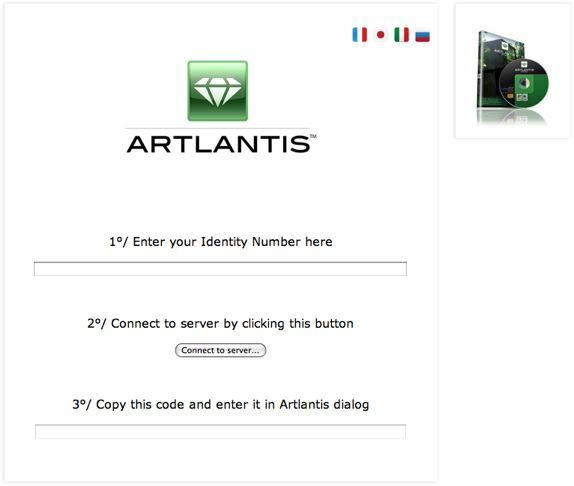 Please note that you have to install Artlantis to each workstation manually. Image file installation, or cloning the application are not supported. 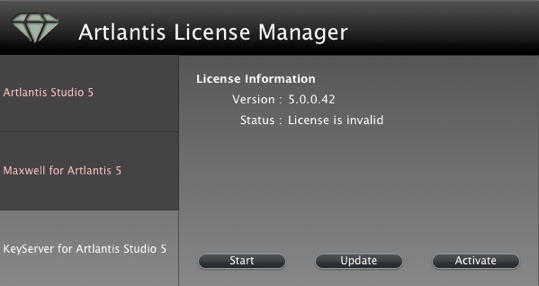 Make sure that Artlantis License Manager is launched on the server. You can now launch Artlantis on the client workstations.The Artlantis License Manager will appear. Click on KeyServer to find an available key. If there is an available license on the server, Artlantis will be activated and launched immediately. NB: Artlantis Batch is never available when using a KeyServer license. NB: Artlantis License Manager will appear each time Artlantis is launched on a workstation. The user have to click on the Keyserver button each time to get a license. If the Server is running and the message No KeyServer found is displayed on the client computer, it is probably because the client is on a sub-network. In this case, click on the Manual Server Address tab. You will be prompted to enter the IP address of the server. Then click on the KeyServer button. This operation must be performed on every Artlantis client in the sub-network. NB: The IP address of the server can be read in the Artlantis License Manager's KeyServer for Artlantis tab. 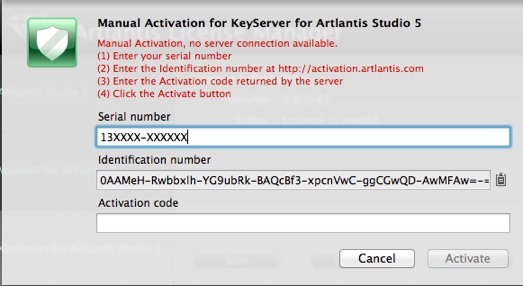 If Artlantis prompts you to enter a serial number on a client workstation: Check that the computer is connected to the network. Check that the Artlantis License Manager has been started on the server. Click the unblock button when the Firewall shows that the Artlantis License Manager or Artlantis is trying to use the network. For another Firewall, ensure that port TCP 50150 or TCP 50151 or TCP 4242 is open. NB: changing this setting does not affect the security of the PC or the operation of other software. Close all connected clients, then close Artlantis License Manager . Only one KeyServer license can be run on the network at a time. The license number has already been activated on another computer. You must deactivate it on the computer in question before activating it on the new one. We continuously work on fixing the known issues with Artlantis. Time to time we release a new subversion. Users receive a message via an RSS system directly to the Artlantis interface about the news. It is highly recommended to perform these updates. Please note that when deciding to update Artlantis in your lab you have to update all the workstations and the server to avoid version conflict. Step 1 - Update the Artlantis application on your server. Then you can perform the update using the latest available installer. NB: You don't have to deactivate the Keyserver license when updating the software. Step 2 - Update the Artlantis application on your workstations. Close Artlantis if it is running. Then you can perform manually th update on each workstation.